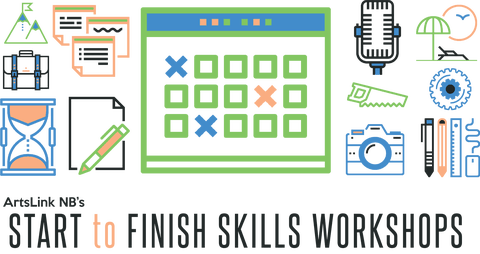 ArtsLink NB has announced the first instalment of their skills workshop series: Start to Finish, which will take place in Sussex on June 28th. This workshop aims to give artists hands-on experience with producing professional quality documentation of their works, through affordable or free technology. This two-part workshop will include sound and music recording in the morning, followed by an afternoon of visual documentation for two and three-dimensional work. Topics include multitrack recording, sound editing, lighting techniques, ideal camera settings, and more. Registrants will have the option to attend one or both parts of this day-long documentation intensive. The morning session will focus on an overview of affordable software, instruction on recording equipment and much more. **If you have a field recorder you typically use, bring it to the workshop. The afternoon session will include a lesson in lighting works, ideal camera settings, tips for recording three-dimensional work, and more. **If you have access to a camera, bring it to the workshop. Workshops are FREE for ArtsLink Members, and $50 for non-members. Memberships with ArtsLink start at $25 – sign up today! For further details or to ask questions, please email: julie@artslinknb.com; Please inform them of any food allergies. All workshops require a $10 deposit. This deposit will be returned to ArtsLink members upon workshop attendance. Non-members will be required to have a payment method prepared for the balance of the cost of the workshop. The workshop will be held on June 20th in Florenceville-Bristol, June 21st in Fredericton and June 28th in Sussex. For more information visit the ArtsLink NB website.